For a limited time, you can buy an Xbox One hamburger from Hong Kong burger chain Triple-O's. Well, here's some news I never thought I'd write - for a limited time, Hong Kong residents can pick themselves up a special Dead or Alive Xbox One bundle that comes with a free, Xbox-themed hamburger. 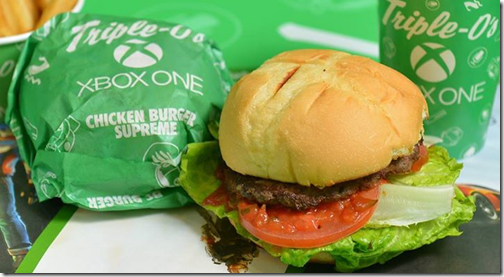 The Xbox burger comes thanks to a cross-promotion between Xbox Hong Kong, Koei Tecmo and local burger chain Triple-O's. The special Dead or Alive 5: Last Round bundle includes an Xbox One system with a 500 GB hard drive, a code for Assassin's Creed Unity, a download code for Assassin's Creed IV: Black Flag, Dead or Alive 5: Last Round on disc, a 3+1 month code for Xbox Live Gold, a Biotherm Homme bag, HK$130 worth of Xbox Live credit, a Dead or Alive 5: Last Round cushion, and a voucher for an Xbox One hamburger - all for HK$3580 (around $460 USD). Of course, if you already have an Xbox One, or perhaps, don't want to buy one just for a hamburger, Triple O's is also selling the Xbox burger a la carte at their restaurants around the region.